CHAMPAIGN, Ill. — Land conservation programs that have converted tens of thousands of acres of agricultural land in Illinois back to a more natural state appear to have helped some rare birds increase their populations to historic levels, a new study finds. Other bird species with wider geographic ranges have not fared as well, however. 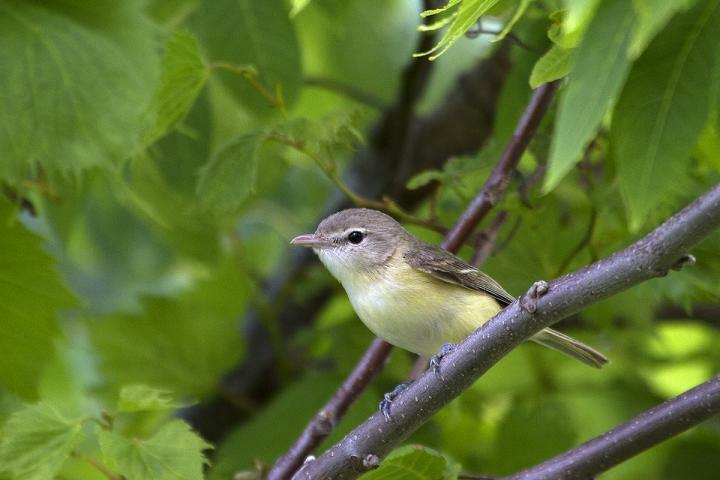 The research, reported in the journal Ecosphere, finds that one of the four species studied, the Bell’s vireo (Vireo bellii bellii), has bounced back from historic declines to more than double its last estimated abundance in Illinois. The growth of agriculture “has negatively affected biodiversity throughout the world,” the study authors wrote. Grassland species have experienced some of the sharpest declines. Conservation programs like CREP use monetary incentives to entice private landowners to voluntarily convert some of their land back to grasslands, wetlands or forest. More than 140,000 acres have been restored so far in Illinois through CREP. To determine how this conservation effort affects populations of specific rare birds, Reiley and his colleagues surveyed 172 randomly selected restored fields in 10 counties in central and west-central Illinois during the 2012-15 breeding seasons. They focused on the Bell’s vireo and three other species in decline: the field sparrow (Spizella pusilla), northern bobwhite (Colinus virginianus) and willow flycatcher (Empidonax trailli trailli). The field sparrow and northern bobwhite still appear to be in trouble, however. Based on the researchers’ estimates, CREP has increased northern bobwhite populations by only 6 percent of the goal. Field sparrow abundance is better, but the conservation program has achieved only 33 percent of the goal for this species. The paper “Are avian population targets achievable through programs that restore habitat on private lands?” is available online and from the U. of I. News Bureau.